Why, When My Friend Got Attacked, Did No One Stop to Help Him? I woke up Wednesday morning to a message from my friend Nathan. He had been attacked on his way home from another friend's house. In spite of how fortunate he is to be alive, this story didn't have to end this way. One of the most troubling parts of what happened is the fact that no one stopped to help him while he was lying there unconscious. We can't let it be this way. If you see someone being assaulted or attacked, please do something. I'm not saying that you should intervene or put yourself in danger, but there are so many ways to help. I woke up Wednesday morning to a message from my friend Nathan. He had been attacked on his way home from another friend's house. Someone had jumped on him from behind and put him in a choke hold until he'd passed out. The attackers took everything he had on him -- his phone, his wallet, his passport, his e-reader, his iPod, his fancy headphones, a book I'd lent him, a sweet pair of corduroy pants we'd found earlier that day at my favourite second-hand shop. Nearly everything of value that he'd owned had been in his messenger bag, and when he woke up it was all gone. He'd spent the night at the hospital, his message said, but he was mostly fine -- just some soft tissue damage in his throat and some bruising on his back. Otherwise he'd gotten off easy. That's what the two police officers -- the ones who had taken him to the hospital and stayed with him the entire time, the ones who had bought him coffee and told him funny stories for hours on end just to keep him occupied -- had told him: that he'd gotten off easy. Sure, all of his stuff had been stolen, but he'd been lucky. So lucky. It could so easily have ended differently. Today, as we walked by the spot where it happened, he said to me, "In my head there's an alternate ending where this is all roped off with caution tape, and it's a crime scene with my body in the middle of it." But it didn't end that way. This -- his hoarse voice, the red marks on his throat, the bloodshot eyes, the list of things that need to be replaced -- is what lucky looks like. But still, in spite of how fortunate he is to be alive, this story didn't have to end this way. 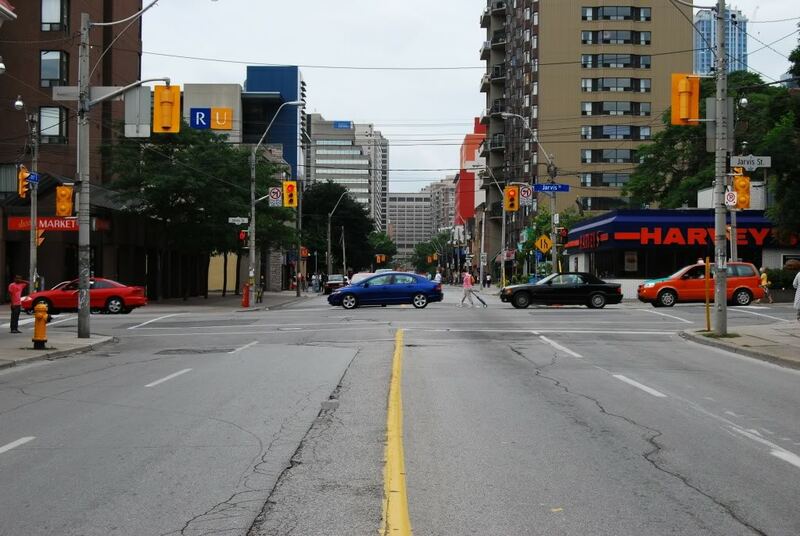 One of the most troubling parts of what happened is the fact that no one stopped to help him while he was lying there unconscious and hurt at the corner of Gerrard and Jarvis -- which, for those of you not familiar with Toronto, is a fairly well-trod intersection. It wasn't late -- only around midnight. And it's not that there was no one around. But no one stopped, or even called 911. When he woke up, disoriented and in pain, he had to drag himself to the nearest convenience store and ask them to call someone. The thought of him -- of anyone -- having to do that makes my heart hurt. And I know that it doesn't need to be this way. We can't let it be this way. If you see someone being assaulted or attacked, please do something. I'm not saying that you should intervene or put yourself in danger, but there are so many ways to help. Take a picture. Write down a description of the attackers that you can later give to the police. Call 911. If you see someone passed out or lying on the street, don't assume that they're drunk or high -- err on the side of caution and call an ambulance. Make sure that they're breathing. Stay with them. If they're coherent enough, offer to contact their friends or family. Above all, don't let the Bystander Effect take over. It's so easy to do nothing and assume that someone else will step in, but it's almost as easy to dial three little numbers on your phone. Do something because that's what a good, moral person should do, or else do something because next time it might be you lying there. It could so easily have been you. And if you have a friend or loved one who's survived an assault, here's a short list of things you should and shouldn't do to help out. Because if I've learned anything over the past few days, it's that watching someone you care for go through something like this can make you feel unbelievably helpless. But, in spite of that feeling, there are things that you can do to help. DO ask what, specifically, the victim needs from you right now -- they might need a hug, or a meal, or some time to themselves, or any number of things. It's better to ask than to try to guess and then wind up guessing wrong. DO offer to take care of practical things -- like going grocery shopping, cooking, cleaning, laundry, or helping navigate how to replace stolen items. DO listen to what they're saying and validate what they're feeling. If they're angry, let them be angry. If they need to cry, let them cry. If they feel hopeless, let them talk about how hopeless they feel without jumping in to tell them that they're wrong. Whatever they're feeling is valid, and you don't get to decide how they should or shouldn't express their emotions. End of story. DO just sit there and be there for them. You might have to sit for hours in what feels like awkward silence, but if they don't want to talk, you shouldn't try to force them. Let them decide how your time together will be spent. DO respect their space. If they don't want to be hugged, don't hug them. If they don't want to be touched, don't touch them. If they want to be alone, let them be alone. Try as hard as possible not to violate their boundaries, because now more than ever is the time when they need to feel that their boundaries are being respected. DON'T say, "I can't believe this happened to you!" Don't say, "But you're so tall/big/strong/whatever, I can't believe anyone would think of attacking you." The truth is that it did happen, and making remarks about the victim's size or strength will only lead them to feel like the assault was their fault. Because, just for the record, it wasn't their fault. DON'T ask if they'd been drinking. Don't make remarks about what a bad neighbourhood it happened in. Don't ask what they were wearing, or if they had headphones on. Chances are that they are already well aware of how these things might have increased their risk of being assaulted. You may think that you are asking innocent questions, but chances are that you are just making them feel worse. DON'T make this all about how you feel. Yes, the fact that they were assaulted was also scary for you. Yes you are allowed to have feelings and it's fine to want to talk about that and ask for support for yourself, but the person who it happened to is not the person to do that for you. Right now, they need to space to process their own emotions, and your job is to make that as easy for them as possible. DON'T offer advice on how they should go about healing from this. Instead, recommend that they see a counsellor or a therapist. Seriously, leave that type of stuff up to the professionals. I'm sure that I'm missing some stuff here, and I would love if you could leave any further tips or advice in the comments. In the meantime, I'm just going to go back to thanking whatever power is out there that kept Nathan safe that night. Because seriously, I am just so overwhelmingly grateful that this guy is still in my life.